Little man loves reading books, we read at least one book at bedtime and several books over the weekend and school holidays. I am proud to be a Tidy Books Ambassador, a few months ago we reviewed our first product: Tidy Books Kids Bookcase, little man fell in love with it as soon as he saw it and he is still very proud of his bookcase in his bedroom, he shows it to everyone that comes to visit us. 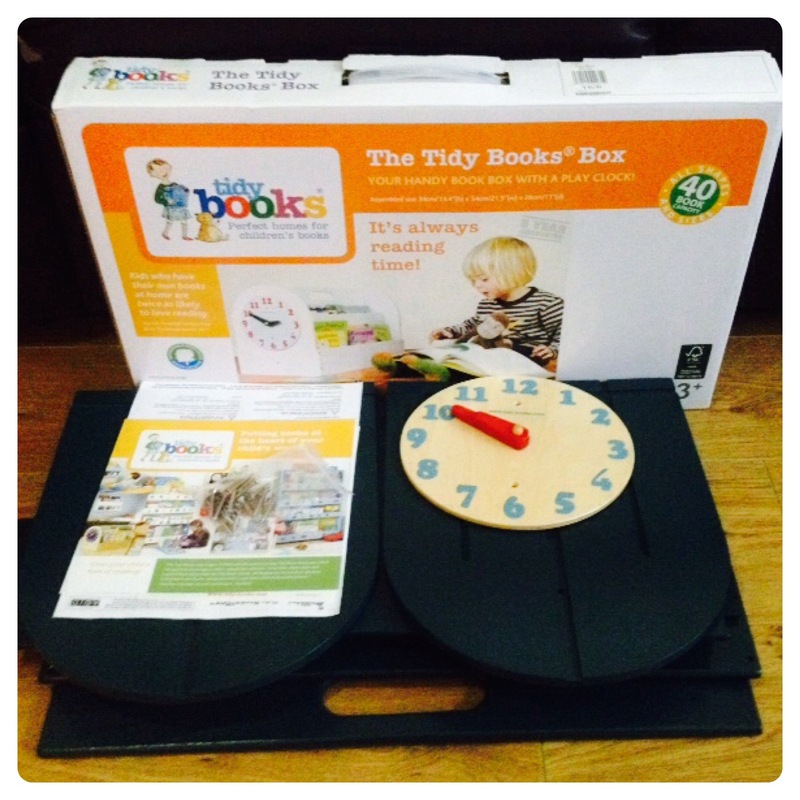 We were sent another Tidy Books product to review: Tidy Books Box (RRP £69.00) which is a handy book box with a play clock, it comes with a five year warranty. The Tidy Books Box encourages independent reading, it holds 40 children’s books and magazines of all sizes and shapes. We have chosen a blue Tidy Books Box, but it is also available in white and natural. 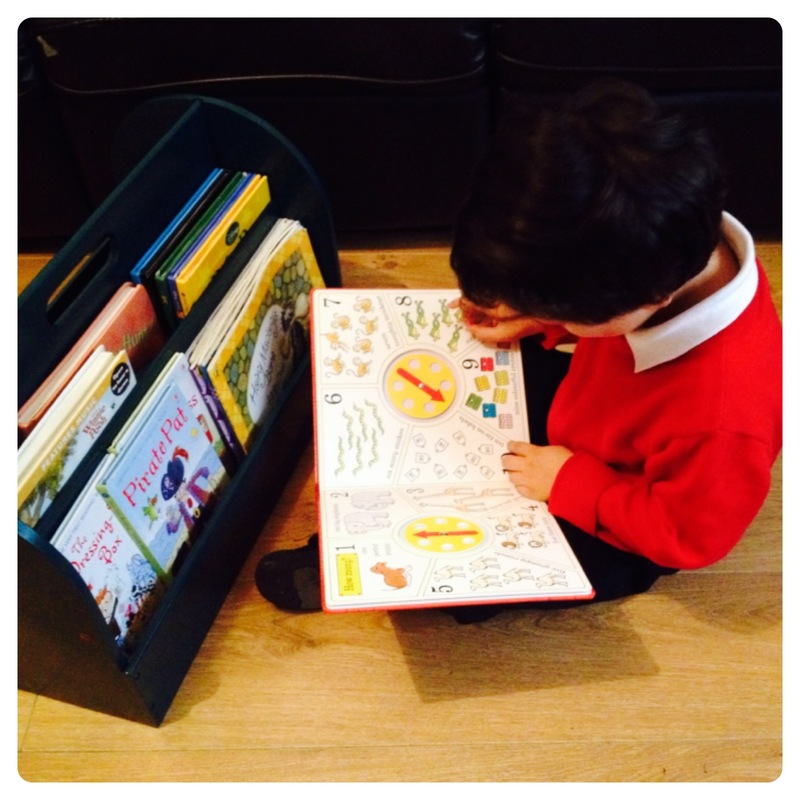 Little man loves the fact that he can keep his favourite books close to hand and organised in his Tidy Books Box. Since he can’t take his Tidy Books Bookcase out of his bedroom, we keep his Tidy Books Box in the living room with his favourite books. It comes on an easy to carry flat pack size, which is easy to assemble and you don’t even need a screwdriver as it comes with everything you need to put it together: screws and handy key. Tidy Books Box is made from wood from sustainable sources and finished in eco-friendly water lacquer, low VOCs. It is sturdy and it is well made, I’m sure it will last for a long time as it seems durable. 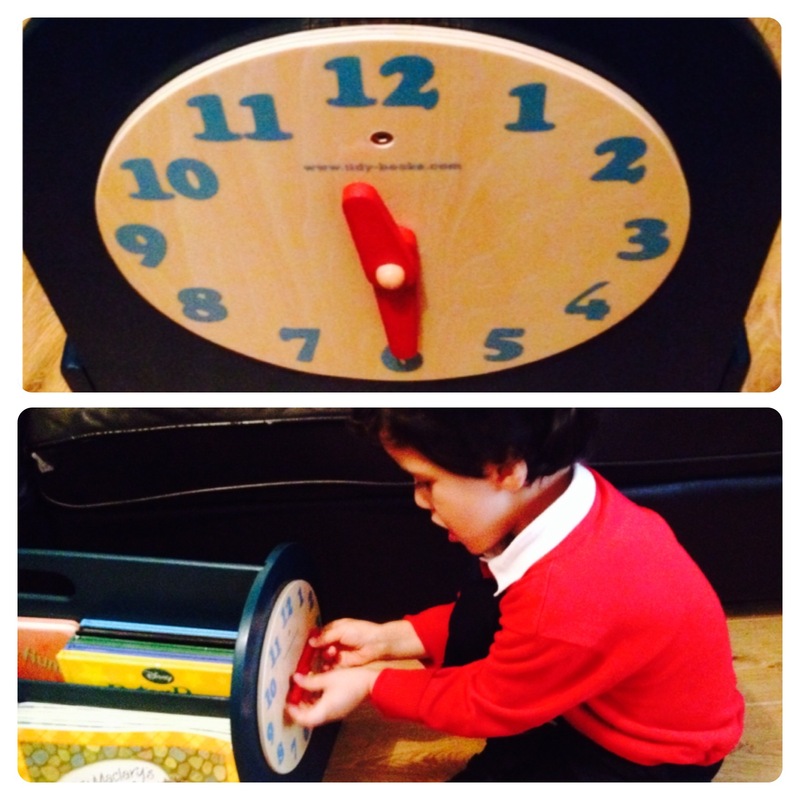 Little man has only just started school and he’s learning to use a clock and tell the time, so he loves the play clock on the side of the box. The play clock can be removed as your children grow, and in case you would like to turn the book box into a magazine box for your living room. Overall, we are very pleased with Tidy Books Box, another great Tidy Books product that has been tried, tested and loved by us! For your chance to win a Tidy Books Box in blue (the same that we have) , please fill in the Rafflecopter below. You MUST leave a comment and subscribe by email (compulsory entries), you can also gain extra entries by tweeting (daily entry), subscribing to other social media channels, etc. T&C’s: The winners will be picked by Rafflecopter after the closing date on Sunday 24th November 2013. Lilinha Angel’s World will contact the winners by email or Twitter within 7 days wherever possible and will allow 7 days for a reply. Open to over 18′s and UK only. If I do not hear anything within this time period I reserve the right to redraw a winner. Lilinha Angel’s World decision is final. 191 Responses to "COMPETITION: Win a Tidy Books Box"
Read together. Kids love being read to. I like to make a little den in my sons room and we read in there 🙂 Also buy books that have topics that interest your child. I believe that it’s important to start reading to children as soon as they come out of the womb and that this will help them to get into books. I’ve been reading two books to my little boy every night since he was born. He’s 10 months old now and gets excited whenever he sees a book! I think that if children see their parents reading it encourages them to read too as children like to copy those they love. Books that can relate to your child, whether it be activities they do or interests they are interested in. Take them to your local library so they can choose their own books to take home. At my local library there is always loads of activities going on like storytime, meet an author and other book related activities – my kids love them and they are almost always free! Read to them lots when they are little. Make it fun and read together. treat it as a treat and tell them they are very good when they are reading, make it a happy occasion and you will find they will look foreward to reading. Let children point and talk about the book. Read to them from a young age. Also getting involved doing funny voices etc. My kids choose two books before bed every night. Let them pick out the book and read it enthusiastically! Start reading with them from birth! You really can never be too young to enjoy books! Don’t be afraid to have ‘real’ books with paper pages either (as well as board, cloth, bath books) If they associate books as being something really special, you’ll VERY rarely find a torn page because they’ll actually WANT to look after them! I’ve always read to them since they were babies so they have always loved books. Act out the stories with them. I think they pick up on enthusiasm and you can make it so much fun by doing silly voices. If you’re reading the same books quite often they can get really into it as the repetition helps to keep their attention. We had such fun with three billy goats gruff, when I said “UP jumps the ugly troll” I’d always make him jump even though he knew I’d do it and it would set him off with the giggles…ahhhh happy days! be interactive when reading to make it as fun as possible! Read books containing their favourite TV characters! I always read with different voices, I try to bring the characters to life. My sons love being read too, They love actual books too, ebooks are not the same, they like the illusions and try to guess the storyline. 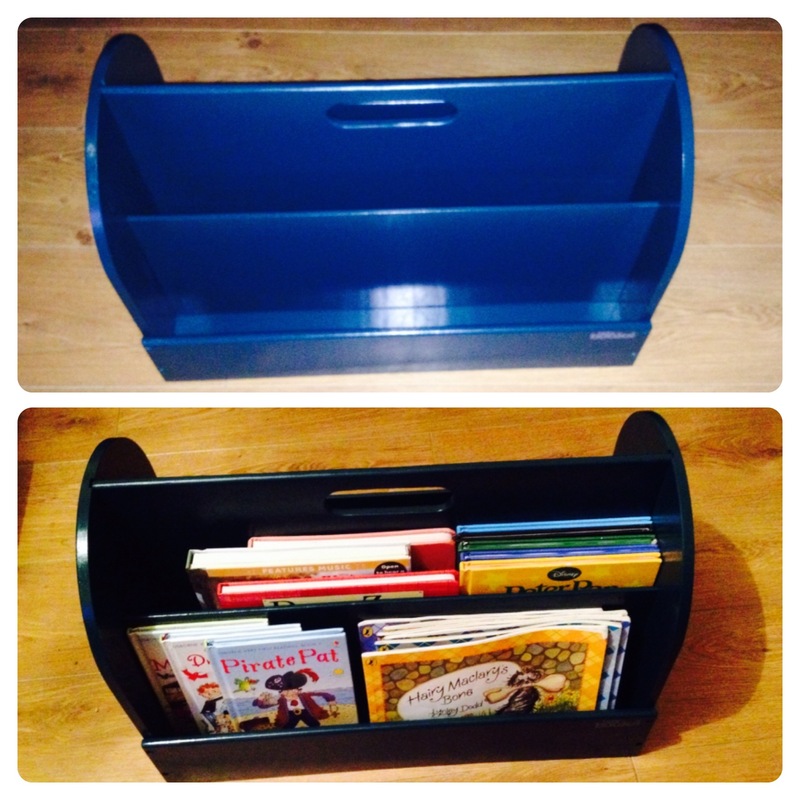 Great competition – The Book Tidy Box looks great! We can never have too many books. We always read to our little ones for half an hour a day, usually just before bed. We choose of different types of books, from story telling books, to poetry books, and choose ones with lots of bright engaging pictures. We encourage the children to ‘read along’ ~ for example, asking them what do they think the characters would say etc. in our house to encourage reading we will let the kids tell us what they think is happening on each page first then go back to the beginning of the book and read it together and see how close they were to the story. This way they get to use their imagination also. I had books round before the books could read. They used to read the pictures instead. We have books everywhere in the house, we also go to the library often! Let them choose their own books and “read” them to you if they want (even if it means reading the same old book again and again). If they’re in control of the reading it becomes play not a chore. Interest kids in reading books since they are babies, so they will grow up surrounded by books from the start, and the best start in life I would say! Buy interactive books with flaps, sounds and of course beautiful illustrations that will improve their taste and attract them to books even more. Read together and talk about the pictures. Make time every day to sit down and read a book – when your out and about try and incorporate their favourite story for example if your near the woods wonder if the gruffalo is there! We took the tv out of the holiday caravan and they just grab a book or comic in bed. Starting early by making it a bed time routine. Let the child choose what to read and stop to talk about what is happening in the story. Start young! And be enthusiastic! Start reading stories to them as early as possible. Use interactive books. Don’t feel you need to read a huge book every night. Try and get a couple of pages in or a chapter if you have more time. Any reading is better than none. Use voices to get them interested in stories and engage with what you are reading to them, and then they’ll have more enthusiasm to read themselves. Start early. My partner was nervous about bonding with the little one once he was born and our midwife suggested talkibg to my bump.. (also because of his deep voice baby would recognise it when born and itd settle him – very true). Make it fun, start with both of you reading allowing child to build on confidence then. Always talk about the book after asking child what they thought. Let them see you reading a lot as kids imitate what adults show them. read out loud, ,all the time! you need to make reading fun!! I have a variety of different voices for different characters. Use your imagination as much as you want your child to use theirs! I love making up different voices for characters and adding little extra bits to get the excitement going… if you make reading fun and show how much love you have for reading your child is sure to love it too! Have a wide choice of books, and when reading at bed time let them hold the book and point at the pictures. For boys I think they need exciting books that interest them. Start early and never miss an opportunity for a book! Let them see YOU reading, and having plenty books around the place, then they’ll know it’s a good thing to do and want to copy. Get Daddy to do the bedtime stories! i was bought up to read as were my brother and sister and we always make it fun for my nieces and nephews to read. by finding the books that they like. Pheonix loves fairies, so the majority of her books are about fairies she sits now on her own reading them, and loves it. she never goes near a kindle as i believe the importance of a real book in your hand where you can see the pictures imagine that you are there in the story with them, pheonix believes in fairy land because of this and will read every day. Take time out every day to sit and read to or with them. Both of mine sat on the potty with a book whilst I sat on the loo with a book….they are both massive bookworms now! Don’t read e-books read real books with the child, feel, touch and smell of a real book can never be replaced. Its all about the voices! Read to them from an early age. I also think its good for kids to see their parents enjoying books. Make them available , read to them but don’t force it . Start reading together from an early age! Make a time your special reading time and stick to it, make sure they’re comfortable and let them choose books they enjoy. Read with your children, and lead by example with reading. Get your child involved with books right from birth. You can get some lovely touch and feel books which babies can play with and learn from. always have a story to read at bedtime. Take them to your local library! Let them see you reading everywhere, not just books – papers, recipes, shopping lists, tv listings, the side of the bus!! Charity or passed on old books so you are not afraid if your child damages them.